A lot of people may see this and think ‘Quorn… gross’. However, I guarantee that this is delicious. I used to be Pescatarian (involuntarily as I was allergic to all animal protein besides fish and egg whites until I was 8), so Quorn was a huge part of my diet as it’s a great way to get a healthy dose of protein. Unfortunately for vegans, not all Quorn products are suitable for your diet as a lot contain egg whites. Either way I would say for those non-vegans out there, it is definitely worth a go, you can learn to love it as a nice alternative from meat now and again. This dish is also very simple to make and should only take about 20-25 minutes including both prep and cooking. 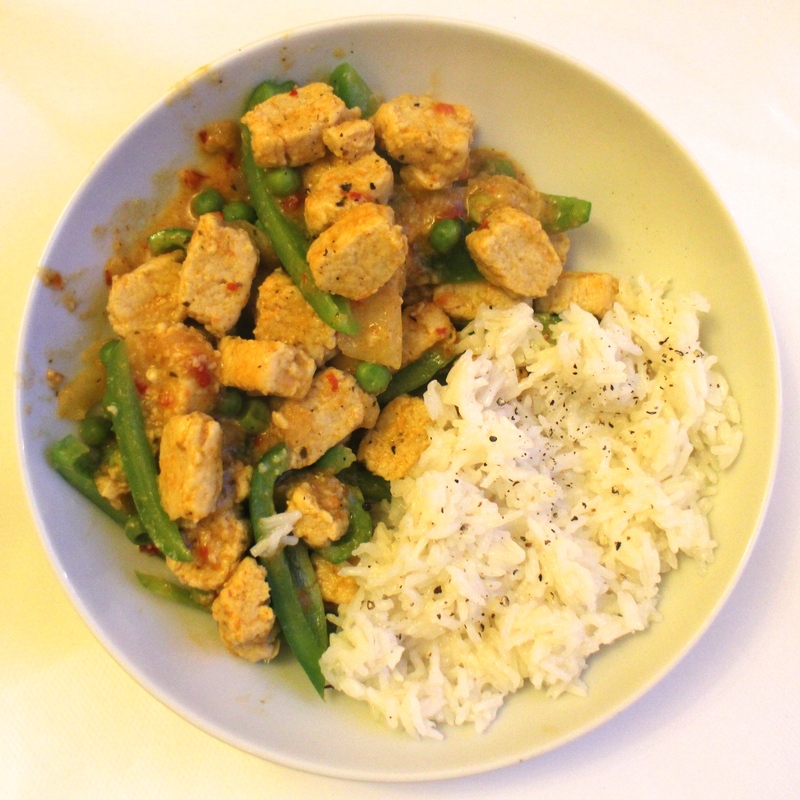 It is a relatively low fat dish and as Quorn is lower calorie than chicken… you can have even more of it. First cut up your onion and pepper and put aside. Then fry the onion in the coconut oil until the onion goes slightly see-through and then add in the Quorn chicken. Fry for about 5 minutes and add in the peas. Allow them to defrost in the pan. Then start to cook your rice according to the instructions on the packet. Add in the curry paste to your dish along with the coconut milk and fry for a further few minutes. When it looks like the ingredients are cooked (which they should be by now), add in the pepper – if you prefer your pepper to be soft you can add it in earlier, or leave it to cook for longer. However I prefer it to be a bit crunchier so I will only fry it with the rest of the ingredients for a few minutes at most. Both your curry and your rice should then be done! Enjoy! All in all this meal is very cheap to make and I normally save one portion for the next day. Hope you like it and if you do and you make it then let me know on instagram by tagging us and using the #whygowithout hashtag. Eggs are my staple food. I buy a pack of 12-15 at the beginning of the week and I normally get through them all by the end. There are so many things you can make with them. Protein pancakes, egg fried rice, they can be scrambled, boiled, poached etc and the list goes on. They are so cheap and provide you with lots of crucial nutrients, giving you a nice serving of healthy fats and protein. of people think you have to eat brown rice if you want it to be ‘healthy’, but white rice is great too! And if you have a high fibre diet like me, its best to try to limit fibre in places you can, so I always eat white rice (it also cooks much faster). In the mean time chop up the spring onions and mushrooms and put aside. Get a pan and pour some oil onto it. Heat it up and then add the frozen peas. When the peas start to change colour, and look as if they are defrosted, add the spring onions and mushrooms and fry them for a few minutes. By this point, the rice should be nearly done. Try a bit to make sure it is cooked to your taste. When it is ready add it to the pan. Fry together for less than a minute and then crack the egg into the pan and with a wooden spoon stir quickly. The egg will start to scramble in the rice and veg. When the egg looks like it is evenly distributed and cooked, add the soy sauce and season with some salt and pepper and stir more. You’re dinner is ready! Serve with chicken or fish for a protein packed meal. 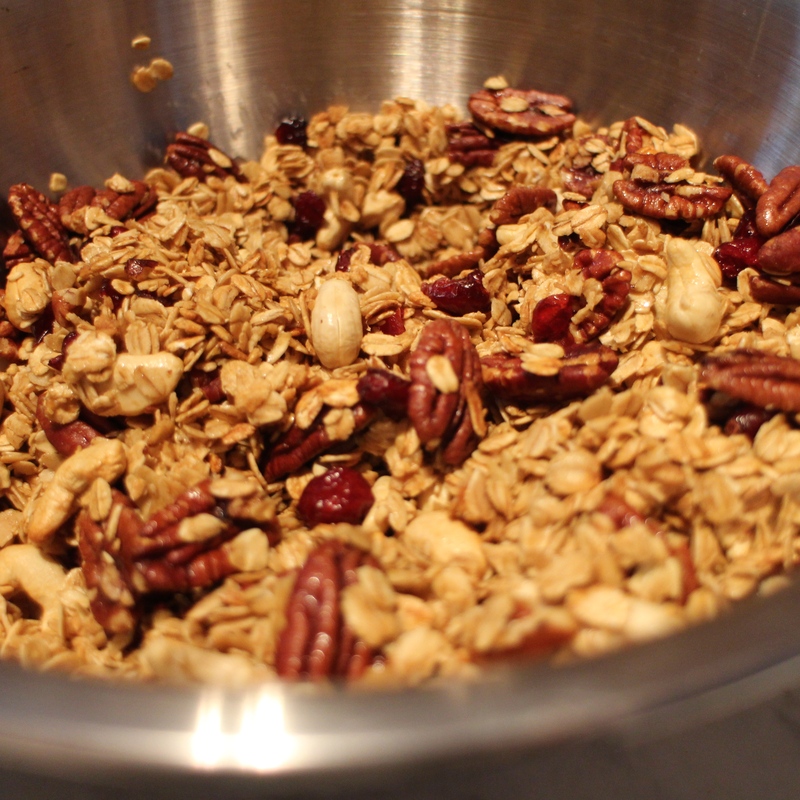 If you follow us on Instagram you will see a lot of our home made granola. Shop bought granola is fully of nasties, often high in both sugar and fat – not what you want to top your yoghurt with. So here is our clean granola recipe. Everyone in the family loves it and everyone you live with will love the smell it makes in the kitchen when its being made! You will need one large mixing bowl, a wooden spoon and either a Tefal air fryer or two flat baking trays and an air tight container. Mix all the ingredients except the dried fruit in a bowl. Put it all into the Tefal Air Fryer. Cook for 7 minutes in the Air Fryer. Then add the dried fruit and if cooking in the air fryer and cook for a further minute. Leave to cool slightly then transfer to a storage container. When completely cool secure the lid and give it all a good shake. It will keep for around a week. Put into two flat baking trays and make sure its compact by pressing together. Bake for 10-15 minutes on 180 degrees Celsius (fan assisted). Leave to cool slightly and then transfer into storage container. When completely cool secure the lid and give it a good shake. It will keep for around a week. Enjoy! If you do make it let us know by tagging us on instagram @whygowithout. The quote is from one of my favourite TV shows (Parks & Recreation) and I have to say I agree. Nothing beats breakfast for me. I prefer a sweet breakfast of pancakes, overnight oats, cinnamon and raisin bagels, lots of fruit or just anything covered in chocolate. However, some days will always call for some eggs and smoked salmon (mainly those preceded by some drinking). o have a huge bowl of sugary, chocolate cereal with lots of milk. So the biggest issue for me when I went dairy free was trying to figure out what on earth I could eat for breakfast. I was in university halls at the time so the only option seemed to be some suspicious looking eggs or toast and jam. Toast and jam it was… for months. I kept getting so hungry later in the day and ended up eating more as a result. When I went home I discovered overnight oats, and my world was changed forever! I missed my indulgent breakfast and this really hit the spot, and if anything I prefer it. It is basically cold porridge, however I’ve found myself getting far more creative with it than I ever did with porridge. It is also gluten free, so if you think you have problems with gluten this is an ideal, quick and easy breakfast recipe. Around 100ml, depending on how dry or wet you like your oats, of a milk of your choice (my favourites are dark chocolate and almond alpro milk or sweetened almond milk). I’ve also started added a teaspoon of cinnamon in and mixing every now and again, I really recommend it! Mix the oats and the protein powder in a jar together and then add the milk. Close the jar and then leave it in the fridge overnight ideally (or if not for a few hours) to let the oats soak up the liquid and puff up. freedom chocshot (any of their flavours) goes lovely with it along with some peanut butter or PB2. It really makes for an idea breakfast which you can take with you if you’re running late for work or indulge in with lots of toppings if you have the time. It’s high in fibre and protein and low in fat and will leave you feeling full until lunch time! If you make it and like it please let me know by tagging @whygowithout on instagram/twitter/facebook and using #whygowithout!